Medialive Live Blackjack - Not as good as expected. Medialive offer one game of live blackjack but it’s presented in two different ways dependent on the options that the casino chooses. Both options are streamed from their studio in Malta. 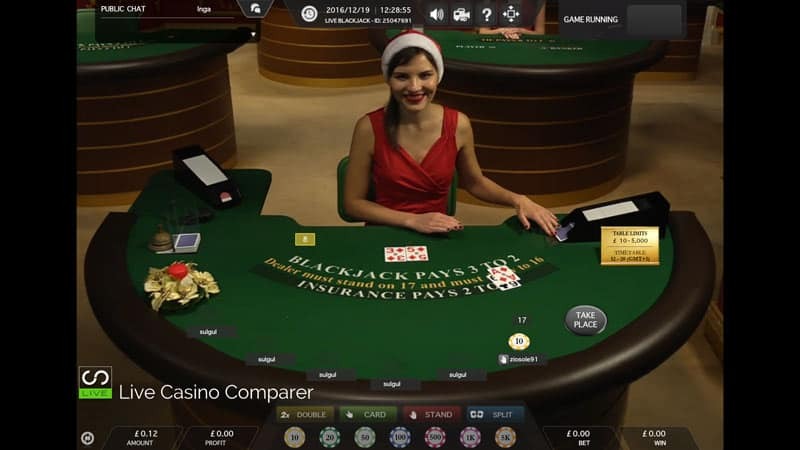 The first option is the more traditional view, where the table is on the casino floor in a generic studio environment. The second is streamed from an area of the studio that uses Chromakey technology to present the game. The casino can brand the environment to their specific needs. So you’ll get one or both of these views depending on which casinos you play at. The game itself is the same whatever version you get. Its an 8 Deck game that is manually shuffled when half of the shoe has been used. The game is played to European Rules where the dealer takes one card. Split Aces take only one card. You can Double on any hand value. You can split any like pair, including any mixed 10 cards. The playing interface has a basic set of configurable options and statistics that can be viewed while your playing. Sound – Mute on On. Viewing mode – HD or Classic modes. Help Text – Opens in separate window with playing rules information. Screen Size – Full screen or normal size. History – Previous player and dealer hands. Chat Box – Only available if you have a playable balance in your account. 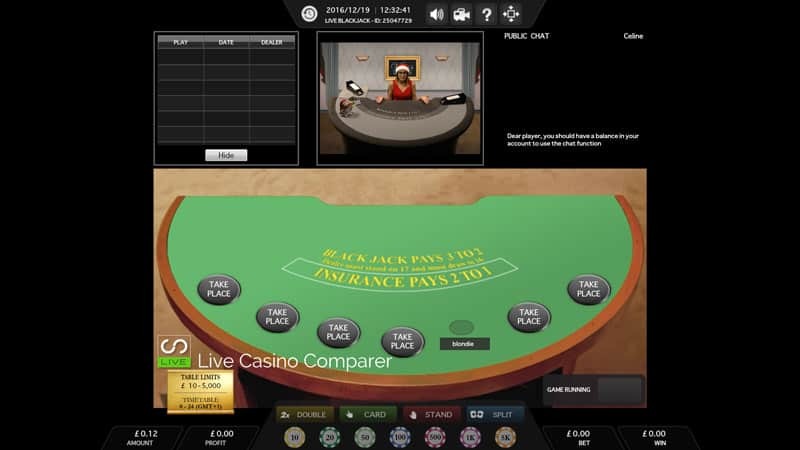 There is a basic set of features available when playing at the tables and they are on a par with other live casino software providers. The one feature missing that would speed up the games is a “deal now” feature when you’re playing on a table on your own. Betting time is 12 seconds, but that can seem like an age if you like a quick game (which I do). 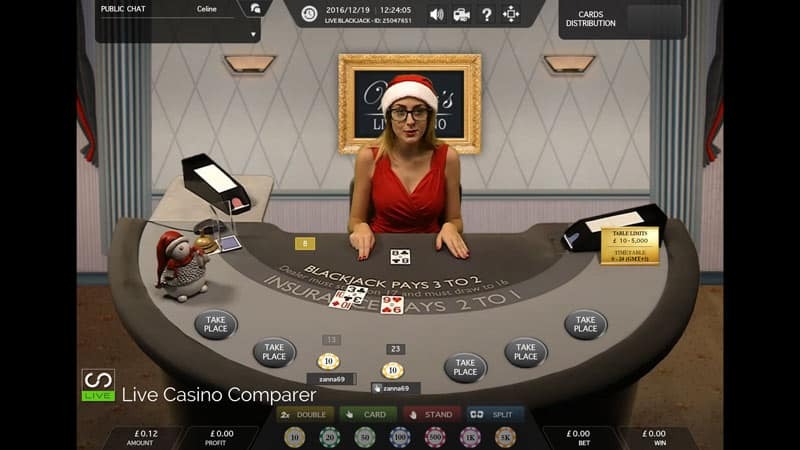 Once you’ve placed your initial bet here is a Pre Decision option that will allow you to decide what to do before the dealer reaches your playing positions. It’s very useful to keep things ticking along, but I have to question why they have made it so small on the screen. If you haven’t selected Pre-decision or your taking a second card you’ll be presented with the larger decision box. The available actions speak for themselves. 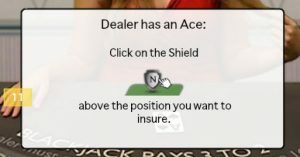 If the dealer has drawn an Ace you’ll be offered Insurance. This is an optional bet of half your initial stake. If the dealer has a Blackjack you’ll be paid at 2:1. You’ll lose your initial bet though so effectively you come out even. If you’ve placed a bet and it has been accepted and then lose connection the system will ask for another card if the value of your hand is below or equal to 11. Once it’s over 11 the hand will stand. This is a slightly better option than just standing on the initial two cards which is what you get with Ezugi Live Blackjack. Good news is that you can play on your mobile device without the use of an App. Being brutally honest I don’t really like the Medialive Live Blackjack for the following 3 reasons. Reason 1 – I don’t like playing against any dealer who is playing European Rules. It just sways the odds more in the house favour when this happens. There’s also no peek for Blackjack, so it’s possible for you to build your hand and add more bets only to find that you lose against a Blackjack. At least at Evolution or Extreme Live Gaming that can’t happen. The hand will never be played if the dealer has a Blackjack when showing an Ace. Reason 2 – The other thing I don’t really like is the darkness of the studio. Don’t get me wrong I don’t mind dark studios, but it’s when the tables aren’t lit particularly well that I have a problem. You can see what I mean in my pictures above. Reason 3 – There are no Blackjack side bets. In my opinion there are better Live Blackjack options.